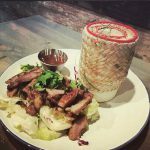 Chim Thai Street Food | Bringing the Street of Thailand to Pasadena. Chim! 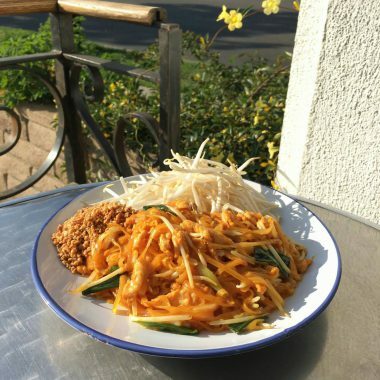 - Thai Street Food - We bring Thai Street food to Pasadena. Download our app to check out our current news and promo. 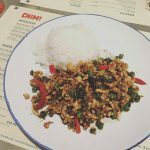 Chim means to taste in Thai. Chim! 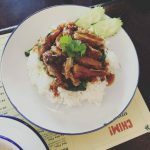 “The Tastes” of Thai Street Food is about bringing simplicity of good eats on the street of Thailand. Every dishes on our menu represents the street vendors as if you are visiting Thailand. Chim! signature stir fried noodle dish. Thai basil, and bell pepper, stir fried in garlic sauce. Grilled marinated pork, served with signature CHIM! spicy sauce. Grilled marinated beef, scallions, onions, cilantro, roasted rice in chili and lime juice. Wikipedia Nam tok can be also an Isan and Lao meat dish which is similar to lap (larb). This dish is known in Lao as ping sin nam tok (Lao: ປິ້ງຊິ້ນນ້ຳຕົກ) and in Thai as nuea yang nam tok (Thai: เนื้อย่างน้ำตก, “waterfall grilled beef”), if made with beef, and as mu nam tok (Thai: หมูน้ำตก, “waterfall pork”), if made with pork. The name supposedly refers to the fact that there is still “water”, or liquid, in the meat, that is, blood. 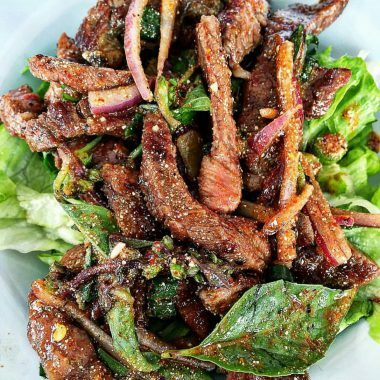 The “dressing” of this meat-based salad is made with ground roasted rice, ground dried chillies, fish sauce, lime juice, shallots and mint leaves. It can also feature spring onions. It is traditionally eaten with sticky rice and comes with raw vegetables such as thua fak yao (Thai: ถั่วฝักยาว, yardlong beans) and kalam pli (Thai: กะหล่ำปลี, cabbage). Thai World-Famous Spicy and Sour Soup. Wikipedia – Tom yum, ต้มยำ, [tôm.jām] is a Thai soup, usually cooked with shrimp. 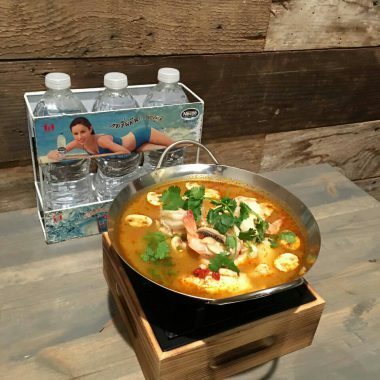 Tom yum is widely served in neighbouring countries such as Cambodia, Brunei, Malaysia and Singapore, and has been popularised around the world. Literally, the words “tom yam” are derived from two Thai words: “tom” and “yam”. “Tom” refers to boiling process, while “yam” refers to a Thai spicy and sour salad. Indeed, tom yum is characterised by its distinct hot and sour flavours, with fragrant spices and herbs generously used in the broth. The basic broth is made of stock and fresh ingredients such as lemongrass, kaffir lime leaves, galangal, lime juice, fish sauce, and crushed chili peppers. Rice noodle, chicken, shrimp, eggs, bean sprouts, scallions, and crushed peanuts. Wikipedia Pad Thai, phat Thai or phad Thai (ผัดไทย) [pʰàt tʰāj] (“fried Thai style”) is a stir-fried rice noodle dish commonly served as a street food and at casual local eateries in Thailand. It is made with soaked dried rice noodles, which are stir-fried with eggs and chopped firm tofu, and flavored with tamarind pulp, fish sauce (nampla น้ำปลา), dried shrimp, garlic or shallots, red chili pepper and palm sugar, and served with lime wedges and often chopped roast peanuts. 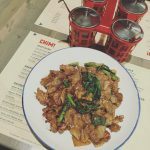 It may also contain other vegetables like bean sprouts, garlic chives, coriander leaves, pickled radishes or turnips (hua chaipo หัวไชโป๊), and raw banana flowers. It may also contain fresh shrimp, crab, squid, chicken or other proteins. 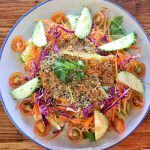 Vegetarian versions may substitute soy sauce for the fish sauce and omit the shrimp. Street of Thailand, we simulate it in our restaurant. Eat here, Eat there, pleasure to eat everywhere. No rush, stay with us and try the awesome food we provide. We love to cook, we love to serve. Street food fits everyone. Five to hundreds years old welcome. Best ingredients create healthy and happy people!! That’s right!, It’s Monday to Saturday!